This is one of the latest cargo bicycles coming out of Denmark. It’s called the trioBike and is imported by Cargo Cycles in Melbourne and sold by South Beach Cycles here in Perth. It’s made of plastic so has a very strong and light body and is fitted out with top of the line parts. However, whilst the frame is particularly light for this type of cargo bike, it does get heavy when your loading it up with 2 kids and lots of groceries. It is actually rated to hold kids up to the age of 9 and 90kg! This type of weight is great for working out the legs but if you’re more inclined to enjoy a leisurely daily ride then making it electric is one of the best ideas you’ll likely have this year. The skilled mechanics down at South Beach cycles have used the Bafang mid-drive kit on this model due it fitting the frame well and being one of the more robust kits suitable to take on the extra load. 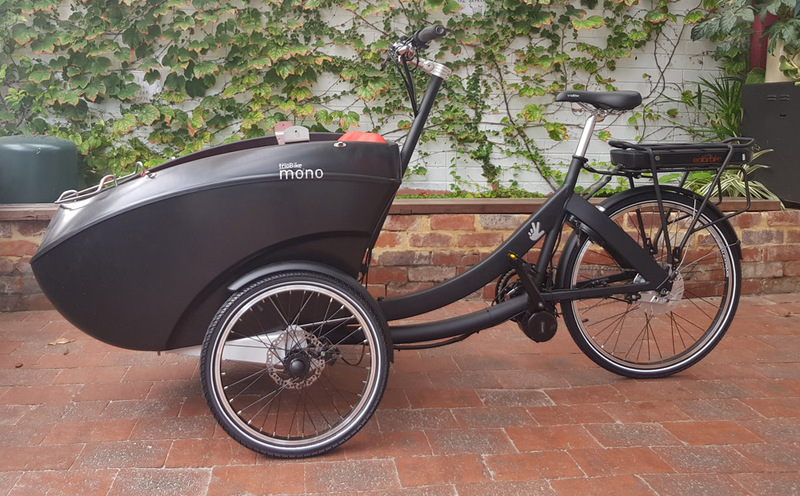 It is a speedy demon on the road now that certainly has it’s place in the genre of electric cargo bike family commuting.